Meanwhile in a separate T&T Newsday Report, the 19-year-old mother of baby of Isiahilia Sterling was identified as Rizpah “Miracle” Sterling. She has since denied being negligent, saying she had been keeping her eye on her two daughters for the entire outing with family and friends. She said she had only taken her eye off the toddler for a second, and in that moment her child’s life was lost. She said she and her two daughters were among 14 people on the outing, which included seven children, and seven adults. At around 4 pm, she said, she was bathing with her two children when she realised her younger daughter, who is seven months old, had begun falling asleep, so she decided to take the baby out of the water and change her. She took Isiahilia and put her on the shore, where she began playing in the sand and building a sandcastle. While she was tending to the baby, she said she kept a watchful eye on Isiahilia. Then, Sterling said, she turned away for a second to put out a plate of food, but before she could take out a spoonful, she heard people screaming for her to go into the water. She ran to the sea to find her daughter face-down in the water and semi-conscious. 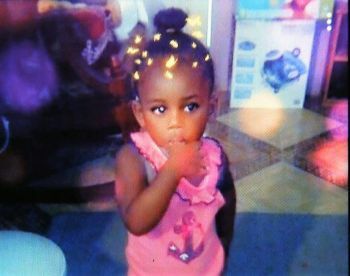 Sterling said while emergency services took the child to the St James Infirmary, she prayed to the Almighty to save her life, and even fell to her knees in prayer at the hospital, calling out to God to spare her child’s life. “I said God, if you save this child’s life I will change mine for the better. I was praying and singing the song Only Believe. Sterling described her child as a loving and intelligent child who, despite her tender age, showed great love to her little sister and her mother and went out of her way to care for them. “Every morning when she wakes up, she kisses her little sister. Every day she would tell me she loves me. She does everything for me. Don’t mind sometimes she is a little hardened and we would fall out, but that is my child. A police source told Newsday, investigators will approach the Director of Public Prosecutions for advice but that will not be until a post mortem is done and statements taken from witnesses.